Skating and shing-a-linging into the new year! I mean, seriously, they tried really hard. But you know what? 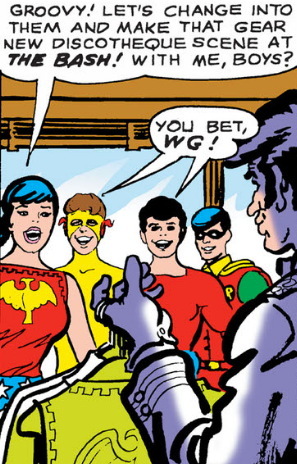 For all that wacky dialogue, this era of Teen Titans is still a lot of enjoyable fun, and not just for how the characters speak the lingo. How can you not love a comic that whips out a Nessie ex machina to rescue Aqualad from imprisonment in a Loch Ness tower? Bless Bob Haney, and bless Nick Cardy for drawing it so beautifully. Here’s to enjoying more comics in the new year, from older classics like these, to new efforts that some talented folks are writing and drawing even as we speak. In which I have some minor spoilers for Teen Titans Go! To The Movies but don’t spoil the best joke. So in my most recent attempt to make the money I’m spending on Netflix worthwhile, I’ve been getting a handful of discs…yes, actual physical media…from them a little more often than I have of late (for example, I finally watched and returned that copy of The Quick and The Dead I’d had in my possession since July), One of my recent borrowings was of Teen Titans Go! To The Movies . a nice, gentle skewering of the superhero movie trend with plenty of laughs…the biggest being Robin’s final line in the film, which still makes me sensibly chuckle even now. Won’t spoil it here, and while it is revealed in the Wikipedia entry on the film, without its context and delivery it’s not nearly as hilarious. Some of the film’s humor was clearly “not a joke for you, a guy who’s about to turn 50 years old” but I thought most of it was pretty accessible, and to be fair, the Challengers of the Unknown jokes were totally for me, so take that, kids. We can only hope this is what he looks like in that upcoming TV series on the DC streaming service. Not a fan of fart jokes generally, but I gotta say, that was a good one in this film. 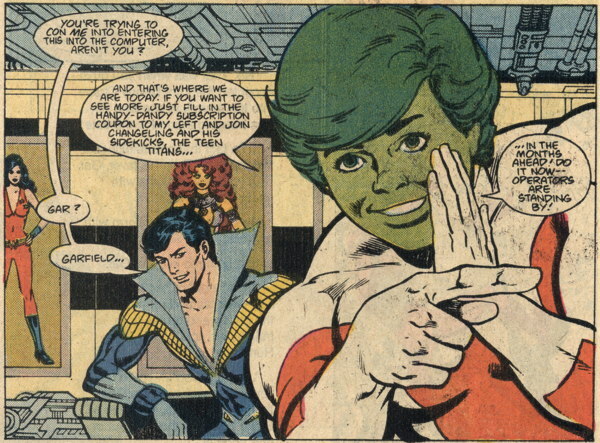 And, the “mid-credits” bonus scene featuring the original, not entirely-gag driven version of the animated Teen Titans, setting up a Teen Titans Vs. Teen Titans Go movie that is apparently still A Thing That Is Happening: well, that should be weird. It’s the battle between the fans who hated that first Teen Titans cartoon and the fans that really hate the new Teen Titans Go! cartoon! Also liked the handful of gags aimed at Marvel’s direction (especially the Big Cameo which I’m very glad was actually voiced by him and not someone doing an impression). Frankly, I was a bit surprised not more was make with the comparison between Deadpool’s real name “Wade” and Slade’s real name (“Slade”)…I can see why they avoided the topic of their identical last names, given certain story events. 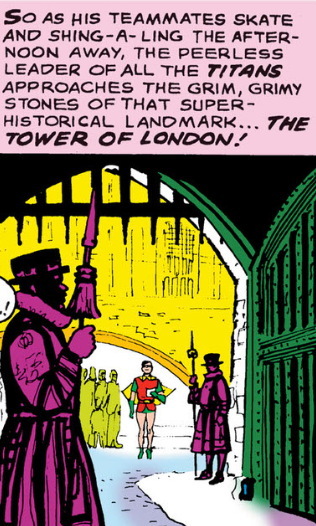 Oh, which reminds me, I thought the repeated gag of everyone rolling Slade’s name around in their mouths to appreciate how evil it sounds was a solid one. 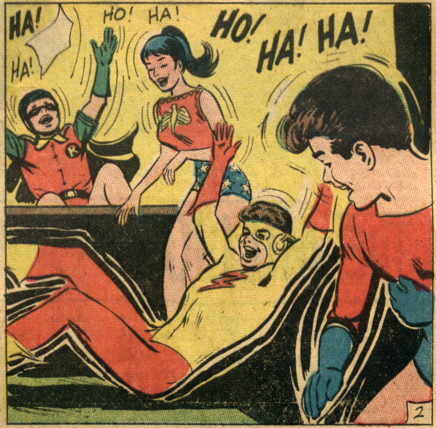 Of course, the darkest laugh is one I already sort of knew about, when the Titans are travelling through time to restore superhero origins they had undone for, you know, reasons, in which Robin…facilitates Batman’s origin. Hoo boy. All those people in the late ’80s/early ’90s who mimicked only the grim ‘n’ gritty parts of Dark Knight Returns only wished they were that dark. So anyway, it’s a good bit of fun, worth a rental if you haven’t seen it already. Or if you have, it’s worth it just to freeze frame on some of the movie posters that pop up in the background here and there. Plus, if you’re a Swamp Thing fan…well, I already showed you why it’s worth your time. Now, I mean despite all that, it looks…you know, at least CW-levels of good (which I realize for some folks isn’t saying much). It does seem awfully dark-ish and gritty-ish at a time when it sort of looks like DC is at least trying to back away from that sort of thing in their media adaptations, which is an odd choice…I mean, aside from the odd choice of having Robin do a swear, of course. I feel like Raven is the breakout character here, not that we saw a whole lot of anyone else, but I can see her being especially appealing to young viewers, which is sort of ironic considering. My other concern, as a retailer who tries to sell comic books (remember comic books? I’ve got a store full of them), is that if this particular bit of dialogue gets traction in cultural awareness, I could see parents steering kids away from Teen Titans comics in the future…”no, you can’t read that, Robin’s a pottymouth!” I did see this phenomenon with Deadpool after that first movie was released…kids wanted Deadpool comics, parents were all “isn’t that R-rated? NO WAY.” Granted, Deadpool comics are not generally speaking for the tykes, but it appeared this reaction was being fueled by the film and not by any particularly awareness of the comics. Of course, that’s comparing apples and oranges, one of the most successful R-rated movies in history versus a streaming TV show that may be seen by upwards of tens of viewers. Who knows what impact this show will ultimately have, in a world where there is an enormous surfeit of superhero media, beyond the novelty of being part of a network presented by a comics publisher? Sure, I’ll be watching, because SWAMP THING TV SHOW, DUH. And I am curious about the Titans show, and the forthcoming Doom Patrol show (despite my reservations that Robotman will almost certainly have a “cloaking device” or something that will make him look like a normal human and not an expensive digital effect most of the time). And there are the digital comics, which…sheesh, I’ll just have to give up sleep at this point to keep up with everything. 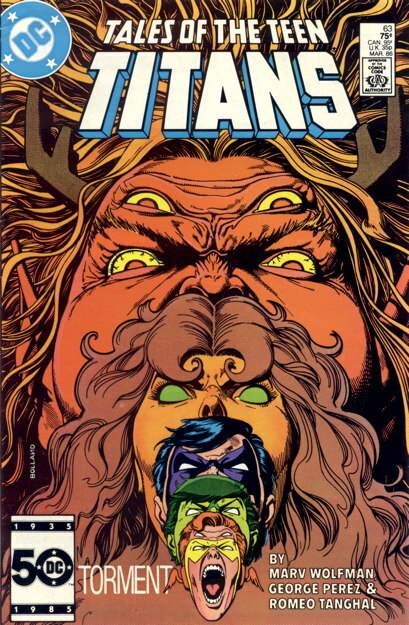 Some folks were wondering why DC would even do this with the Titans, and…well, like I said, to get attention. I mean, aside from Deadpool, you haven’t really seen superheroes with quite so salty tongues. Plus, maybe DC is spreading their Titans demographics…you’ve got Teen Titans Go! for the younger set, you’ve got this new show for the older audiences, and, as was pointed out to me on the Twitters, there’s Young Justice (brand new Season 3 coming exclusively to the DC Universe streaming service, coincidentally!) for the folks who fall in between. I know seeing the shows divided up like that may seem weird to a lot of us who are fully capable of watching all three (or maybe two) of these shows and enjoying them, but hey, that’s marketing! 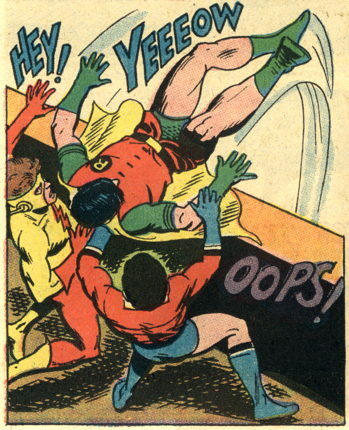 It was something of a relief to hear concerns that were more in-story character based about that specific attitude of Robin’s, like “why would he even think that about Batman to begin with?” And friend, if the people in charge of the DC Universe digital comics service are smart, they’ll curate a collection of the “Robin Is Pissed at Batman” genre for the edification of those in need. Collectors edition Titans collectors comic for collectors. 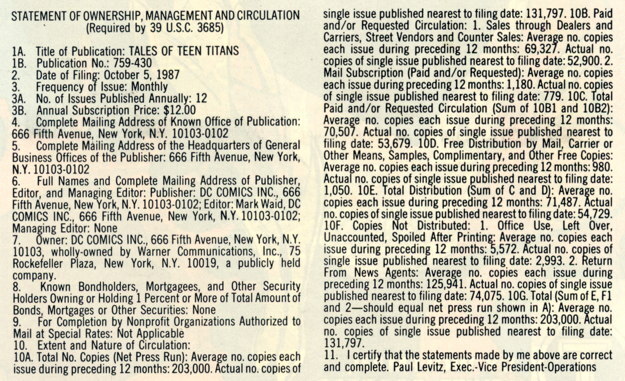 So earlier in the year I spent some time talking about DC’s “hardcover/softcover” publishing program for New Teen Titans , Legion of Super-Heroes , etc. (posts 1 and a 2 and a 3). Thus, if you still need an explanation of what it’s all about, please refer to those posts, because I’m gettin’ back into it briefly for today’s entry. Imagine being the fella cutting open bundles of the latest periodicals to fill the racks and seeing that staring back at you. “THE KIDS THESE DAYS, WHAT ARE THEY INTO?” you’d clearly be thinking to yourself. I mean, that’s an amazing drawing, and one you won’t soon forget, but hey, it’s Comics Code-approved, so I guess the kids are safe. Oh, Brian Bolland, you’ve done it again! …with its Justice League #1-inspired cover acknowledged by artists Michael Collins and Romeo Tanghal. 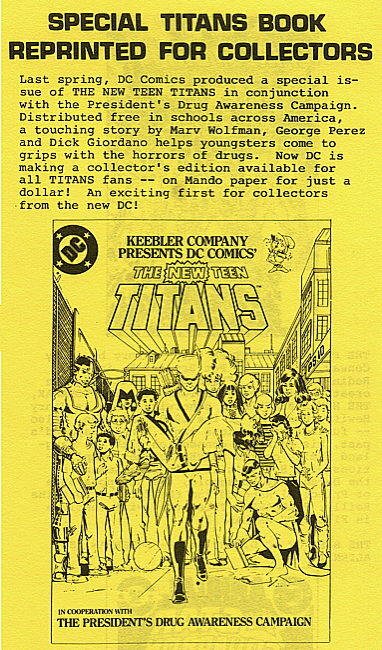 What’s particularly interesting is the frankness of the editorial page inside, explaining that while they wanted to keep all Titans fans caught up with their adventures, the sad fact was that this reprint series just wasn’t selling enough to keep it going. The newsstand customers for this comic are then implored to seek out the direct-sales “hardcover” version of New Teen Titans at comic shops or other venues, or to use the subscription ad in the inside back cover to start getting that series in the mail. …which features only Action Comics Weekly , Power of the Atom and The Wanderers . What I was wondering…was there a separate coupon just for New Teen Titans bound into the comic at this point (seems unlikely), or…if you’ll look back at that scan above of issue #91, you’ll see there’s no UPC code. Thus, this was a copy sold through comic shops…despite being published specifically for newsstands, copies were also available through the direct market for those completists or the thrifty, as previously discussed. 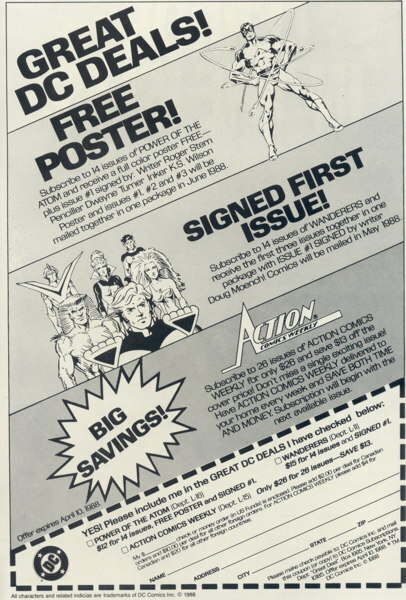 To finish my thought, what I was wondering was if there were maybe different subscription ads inside the back covers of copies that went to newsstands versus those that went to comic shops. Alas, I don’t have a copy of the newsstand edition on hand, but it definitely exists. I honestly don’t know the answer. The previous place of employment no longer has copies, else I’d check there, but maybe one of you can check the copy in your collection and let me know. For your effort, you’ll win the prestigious “Hey, That’s My Name in a Progressive Ruin Post!” award, with a cash value of exactly nuthin’. My initial thought was that they would have changed the subscription ad for comic shops so that they weren’t explicitly telling readers to send money directly to DC instead of spending money at the place where you presumably purchased that copy of #91. But, then again…that’s still a subscription ad, including (I think) the direct-sales only Wanderers . Anyway, I don’t know, but if you know, please let me know. You know? I realize this isn’t the most vital information in the world, but I am curious. 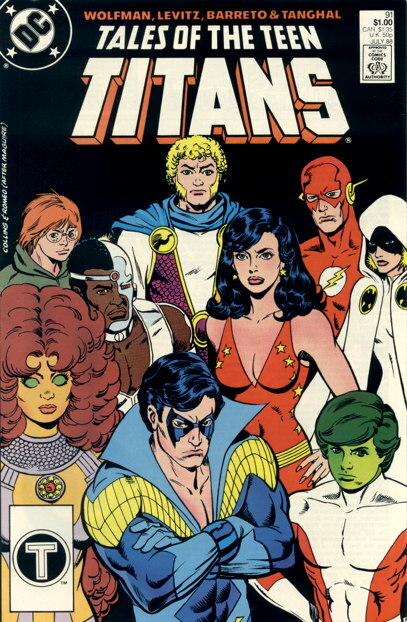 And hey, if you’re a Titans completist, maybe now you’re aware there’s kinda sorta a new story in the back of that last issue you need to have. …and if I’m reading the statement correctly, this sales on this series would put it solidly in the top 25 today. Times have certainly changed. And hoo boy, that’s a lotta returns. I sure wrote a lot on this site lately, so here are some pictures instead.